Mini confirms that the next generation of the range-topping John Cooper Works GP arrives in 2020, but the hot hatch isn't part of the brand's display at the 2018 Los Angeles Auto Show, unfortunately. Instead, the firm has a range of special editions and accessories to exhibit to small car fans. The John Cooper Works Knights Edition (gallery above) is likely the most interesting of this bunch of machines. It starts as the JCW Hardtop, and Mini's team dresses up the vehicle with a Midnight Black and Melting Silver color scheme. Red accents at the bottom of the grille, side sills, and brake calipers add an extra pop of color to the exterior. The special model also gains a John Cooper Works exhaust with a flap system and a pair of chrome tips at the back. Look for the Knights Edition will arrive at American dealers in the first quarter of 2019. The JCW Hardtop also gets a new International Orange Edition, and it's on sale now. The body is a vibrant shade of orange, and the shade is offset with a Midnight Black metallic roof and spoiler. The exterior also has black pieces for the side stripes, fuel filler cap, and door handles, in addition to carbon fiber mirror caps. The models ride on Ferric Gray 18-inch double spoke wheels. The John Cooper Works Pro Exhaust features Bluetooth-controlled flaps and chrome tailpipe trim. Mini will also introduce the Countryman Cooper S Yin Yang Edition to the U.S, and they'll go on sale in December. It's available with a Midnight Black or Light White body, and whatever shade the buyer chooses, the other shade covers the roof and body stripe. Regardless of hue, the vehicles have piano black trim for the grille, headlights, taillights, and door handles. Inside, there are all-weather floor mats. The Clubman S gets a new Starlight Edition, and it's already available for sale. The wagons wear a Starlight Blue Metallic body, and Melting Silver covers the hood stripes, roof, mirror caps, and center caps. It rides on silver 17-inch wheels. The cabin features a luggage trolley, cargo area mat, and Click and Drive smartphone holder. In addition to these special edition models, the brand will show off its Mini Yours Customized range of aftermarket components. The company lets owners personalize the pieces' appearance online. The firm then uses 3d printing and laser lettering to produce the custom parts. 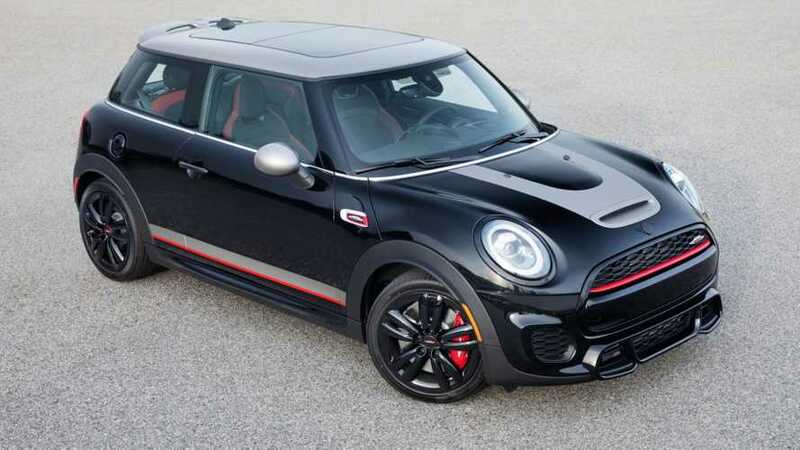 Woodcliff Lake, NJ – November 19, 2018 – MINI USA today announced that the MINI John Cooper Works Knights Edition will make its North American premiere at the Los Angeles International Auto Show starting November 28. MINI also confirmed series production for a new MINI John Cooper Works GP for launch in 2020. The MINI John Cooper Works GP Concept was first presented as a design study at the IAA Frankfurt Motor Show in September 2017 and had its North American premiere at the New York International Auto Show earlier this year. MINI USA will also showcase customized accessories of the MINI Yours Customized offering, which is now available in the U.S. MINI YOURS Customized is a new, innovative offering that allows customers to design and customize four individual products using an online configurator and order them direct from ShopMINIUSA.com/Your-CUSTOMIZED. With MINI Yours Customized, the brand is taking individualization to a new level, using innovative 3D printing and laser lettering in production for the first time.